The greatest joy that One Fat Frog has is knowing that we help people realize their dreams of opening a restaurant. Whether that’s by selling them equipment for cheap, helping them obtain financing, or simply giving them industry advice, the Frog smiles whenever we see a new restaurant open up where we played a part. That’s the Frog’s greatest joy. Our second-greatest joy is when clients come in and bring us food. This is both because it is an intimate way in which our clients can share their love with us by letting us taste the food that fuels their passion, and also because we love eating good food. For that reason, today was a special day at the Frog. Why was today special? Because there was cheesecake. One of our clients has a restaurant called Cheesecake Plus over in Winter Haven, Florida. You may not know this, but cheesecake is one of my top ten favorite things in this world. The cheesecake entrepreneurs gave out slices of cake to the Frogs in our office and after one bite, I felt like I got a small glimpse of heaven. It was like those near death experiences you hear about where someone tells you how great heaven is but unfortunately because they were brought back here, they have to wait to go back. 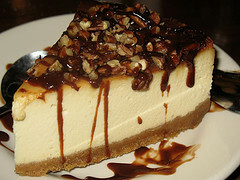 Fortunately for me, to get that feeling again, I just had to take another bite of scrumptious cheesecake. And another. And other. And then it was gone. But I guess all good things must end, even cheesecake. If you’re ever in Winter Haven, I recommend you stop by Cheesecake Plus. And if you ever visit One Fat Frog, I recommend you bring cheesecake. But I guess you can bring another type of food if cheesecake isn’t your thing. The great thing about the Frog is that we like pretty much every kind of food.